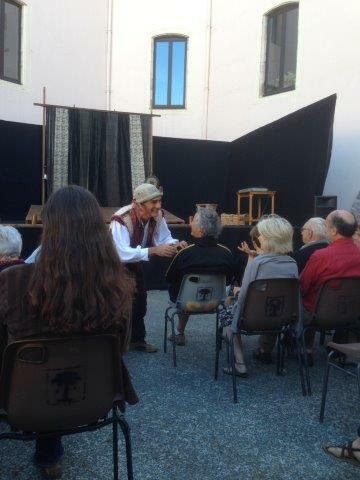 The Journees du Patrimoine took place for the 31st time in France this past weekend. The event was started in 1984 by the then French minister for culture, Jack Lang. The aim was to allow the French public to visit their national heritage monuments and buildings, which were usually closed to the public or rarely visited. Following the success of the French initiative, several European countries started their own “heritage weekends” in 1985, and in 1991 the European Union officially instituted the European Heritage Days, to be held on the third weekend of September each year. 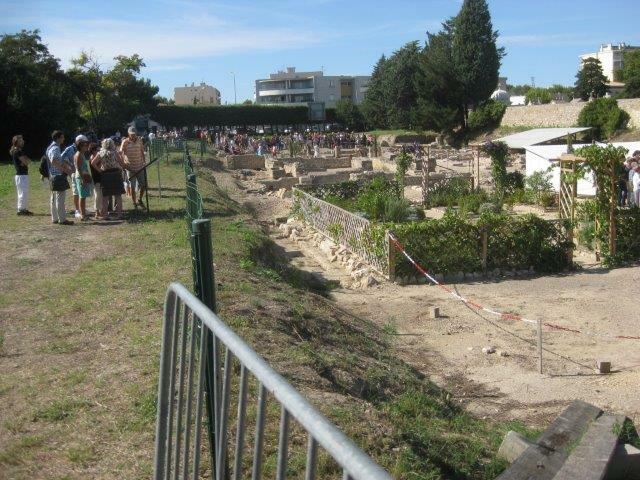 So it was that I found myself in Narbonne last Sunday afternoon, to visit the Clos de la Lombarde excavation site. Narbonne was founded in 118 BC and became the capital of Roman Gaul. The museums in Narbonne have an important collection of finds from the Roman period of the town, and I wanted to see where some of these pieces had come from. 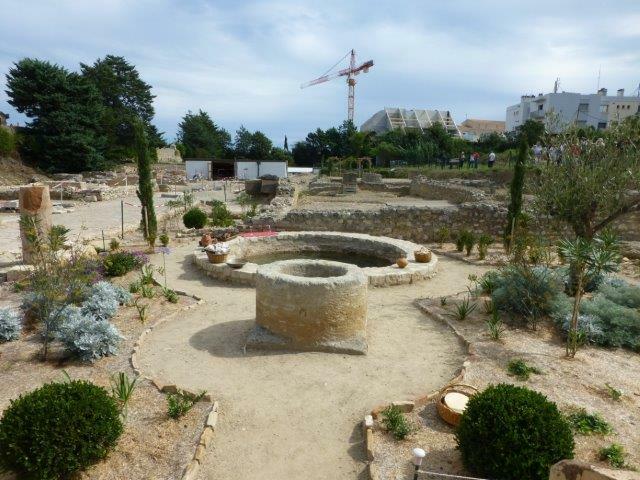 The excavation site is right in Narbonne, next to the cemetery, and it had miraculously survived without being built over until our times. In 1973 the treasury decided to build a tax office on the site, and initial surveys were carried out by local archaeologists. What they found was spectacular, and in 1974 excavations started. In the intervening years, the site has been pretty much excavated all over. Sunday afternoon was hot and humid, but that did not deter any of the many visitors. When I arrived at the site I felt a little disappointed – it looked just like a lot of dust and rubble at first glance. BUT there were guided visits, and after a brief wait, during which I tried my hand at assembling a piece of fresco, we were off with our guide. A word on the fresco puzzle – they were not pieces of real Roman wall paintings, but recreated with plasterboard (sheetrock) and paint. The green areas are the roads, with the two running north/south on the map being major roads, with a well-made surface. 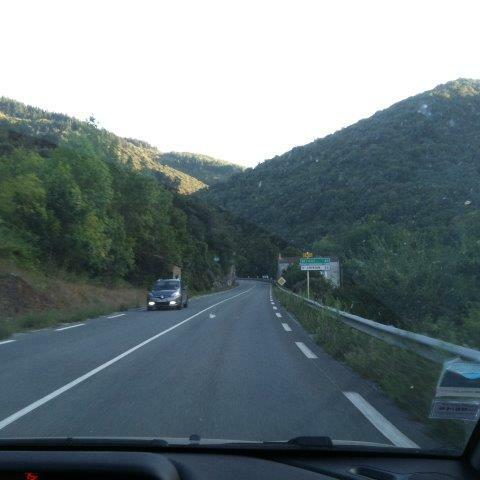 The roads at a right angle were narrower and not as much used. The first house we looked at is called Maison a Portiques, the house of the porches, so-called because it had a porch running along two sides of it. The one along the main road was wide enough for pedestrians to walk under and perhaps for merchants to set up stalls. 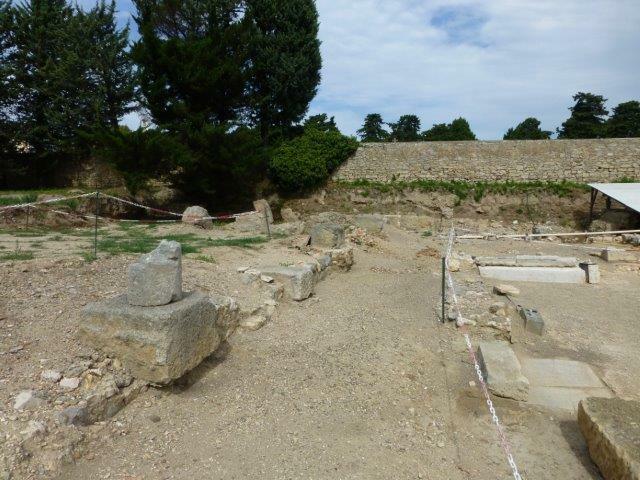 The Maison a Portiques dates from the 1st and 2nd centuries AD. In the picture below you are looking along the road, and you’d be standing under the roof of the porch. The square block would have been the base for one of the columns holding up the roof of the porch. The chains mark out the wall of the house, and on the left of the picture they mark out the edge of the road. The door on the main street led into a spacious hallway, and beyond the hallway was the interior garden of the house. 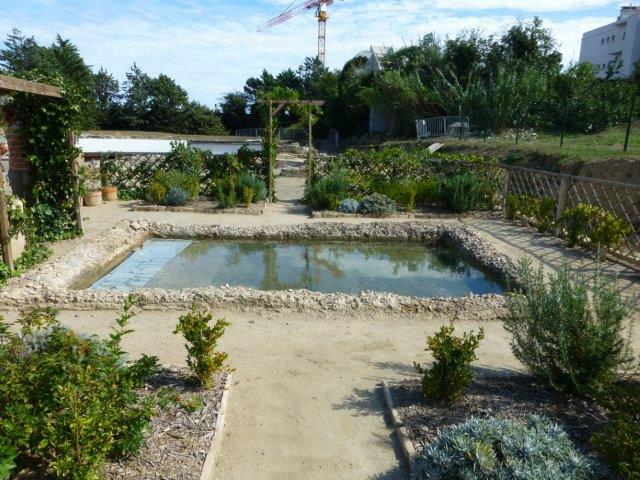 The members of the association Les Amis du Clos de la Lombarde have tried to recreate some feel of the garden. Right ahead is the well – the stone surround is cut from one single piece of rock. Behind it is a basin, which was filled with water on the previous day. 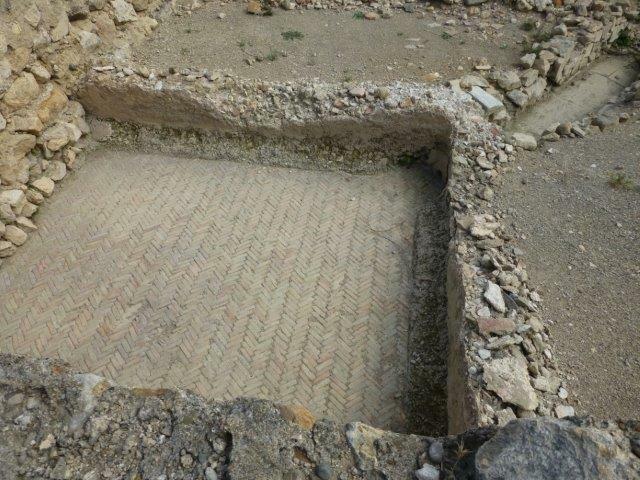 The floor of the basin is covered in opus spicatum, flat bricks laid on their sides in a herringbone pattern. The Romans used a lime mortar mixed with crushed brick to create a watertight finish. 2000 years later it is still watertight – isn’t that astonishing?? Behind the round basin was a square basin. 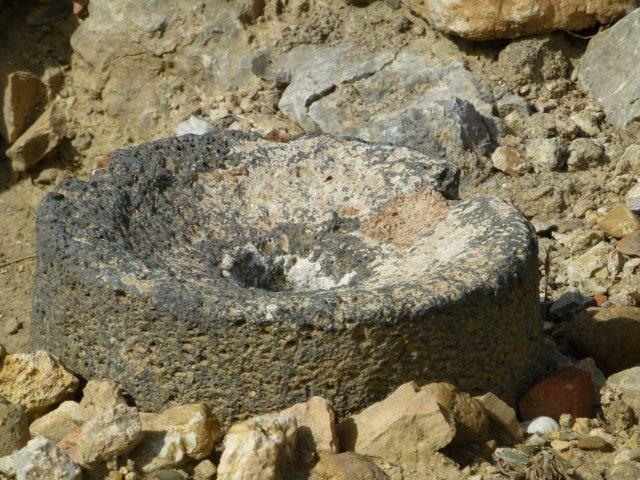 Unfortunately part of that basin had been destroyed when an early Christian basilica had been built in the 4th century AD. You can see the the herringbone pattern brickwork and the slightly pink render on the walls of the basin. In the top right hand corner is a lead plate, which allowed the basin to be drained. All around the edge of the garden was a channel which could be flooded, perhaps to cool the air, or to water the plants? The house was connected to “mains” water by a lead pipe – and in those days not every house had that convenience. If you look very careful at the picture with the channel you can just about make out a raised round area which would have been where a column would have stood. 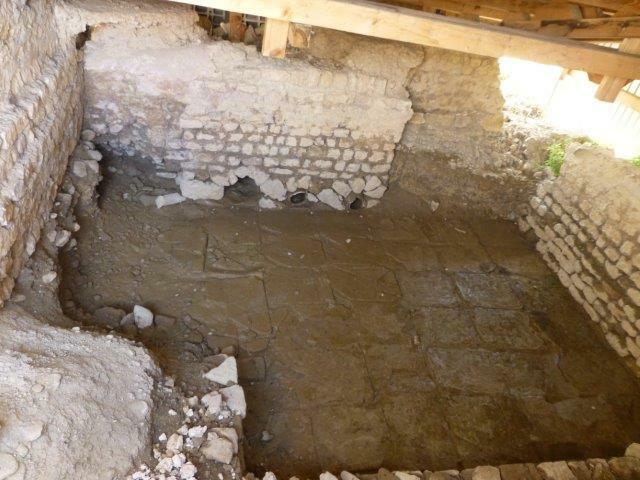 Some of the rooms still had their original floors in place, although to see the beautiful mosaic floors you’ll have to visit the archaeological museum in Narbonne, where they are preserved. Part-way through our visit we had a little interruption. 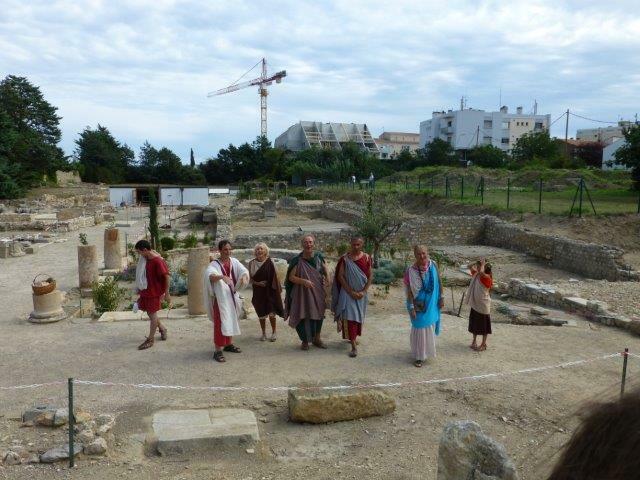 A group of local amateur actors had prepared a sketch after a story by Seneca. Lucilius, the owner of the house of the porches, had invited Marcus Clodius, his neighbour, and Sagaristio, a friend, for a house-warming party. Unfortunately the construction works were running late (some things never change 🙂 ). The triclinium, the dining room, was not yet finished, so Lucilius offered his friends some of his fine wines. Lemniselenis, the wife of Marcus Clodius, had not been invited, but told us bits of the story from the sidelines. There was a little incident with one of the servants, which required some audience participation :)! All of the dialogue was spoken in Latin, but I confess that I did not remember very much from my school days!! It is located under what could have been stairs up to a first floor. Its use? 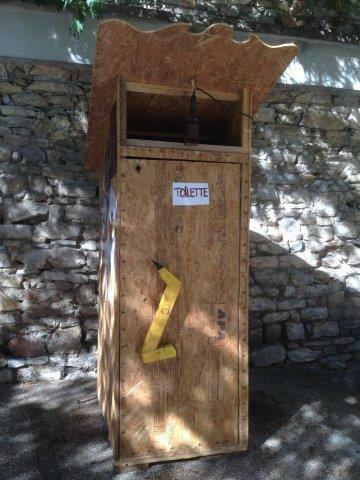 A kind of emergency toilet! 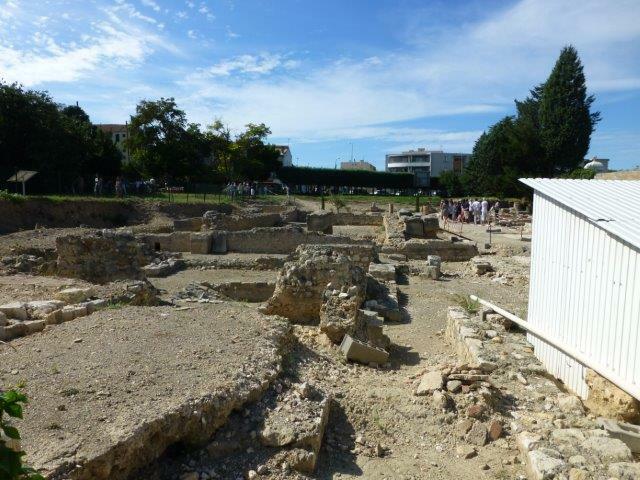 The Roman houses did not have their own toilets – if you had to go, you went to the neighbourhood therme, the baths, to relieve yourself. This emergency toilet was or is still linked to the drain which is in the road outside the house. To give you an idea of size, the Maison a Portiques occupies 975 square metres (8775 square feet). It must have been a large house, even in its day. The adjoining house on the block is called Maison III, and is slightly smaller; it “only” occupies 700 square metres (6300 square feet)! Maison III is known the way it was in the 2nd century AD. Fashions had changed, and the garden of this property was surrounded by the house in a U-shape. The basin in the garden was entirely lined with white marble. And amazingly, this basin also still holds the water! 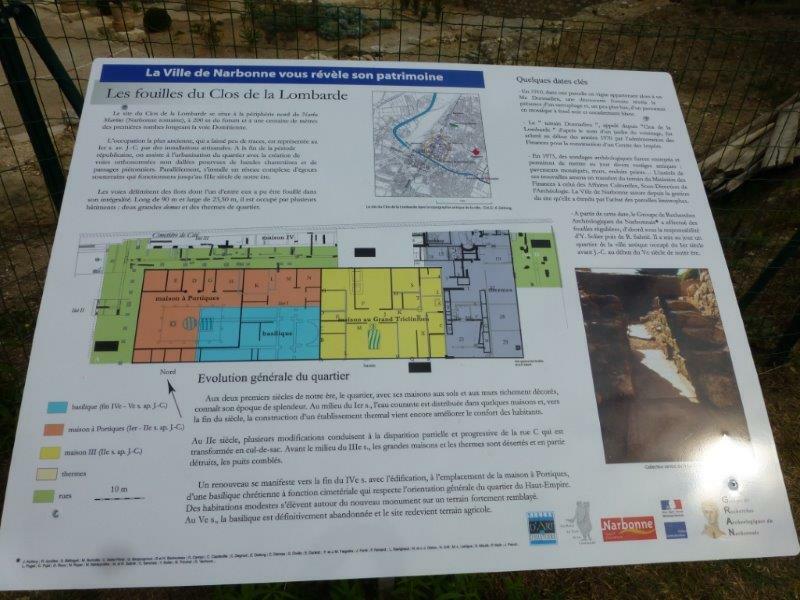 Maison III also held a real puzzle for the archaeologists! In one of the rooms the floor was badly cracked and subsiding. When they probed underneath, they found that something had been filled in. And when that something had been fully excavated, it appeared to have been a giant fish tank – a living larder. 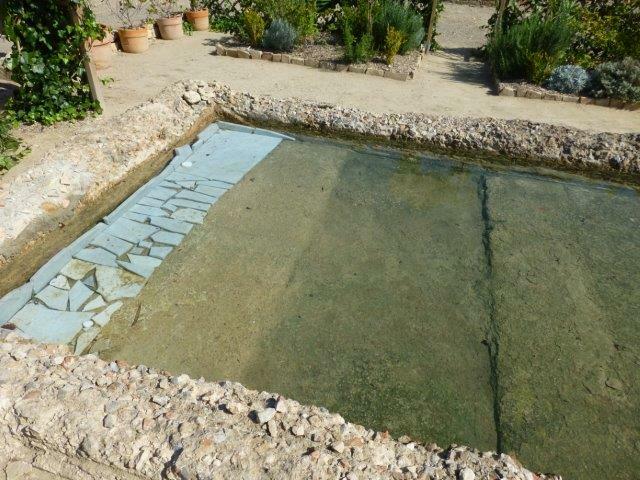 This pool could be filled by a lead pipe from the well, and there was also a drain to the street. On one side there were steps into the water, so the fish could be caught easily. The holes at the bottom are the mouths of amphorae. Perhaps they were there to allow smaller fish to shelter from larger predatory fish? The final part of our guided visit covered the early Christian basilica, which was built towards the end of the 4th century AD. 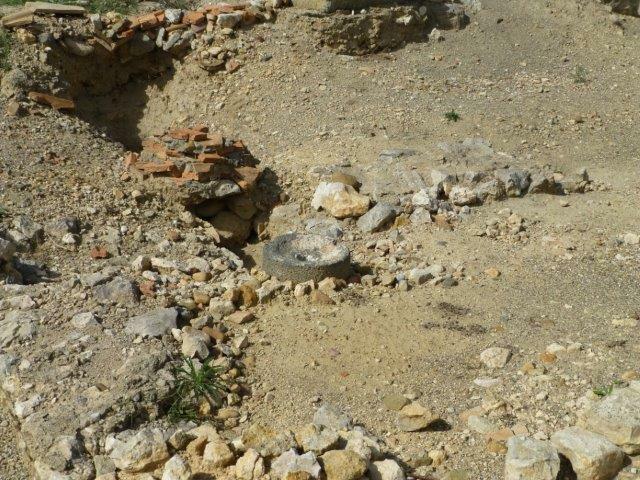 Some of the cut stones from the earlier constructions were reclaimed for the building of the basilica, which was built over the remains of the Roman houses. I think I’ll leave you here – there’s so much to discover, so much to see, so much historical context! It would be beyond the scope of this blog to give you much more information – I leave that to the experts, who will be only too happy to show you everything there is to see at Clos de la Lombarde, when you visit yourself! 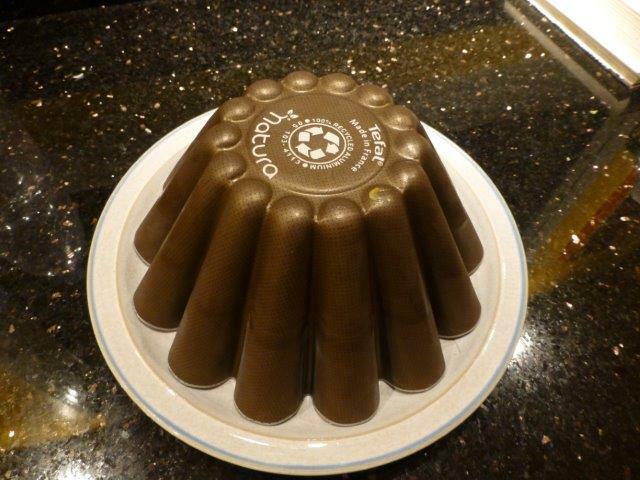 A friend recently told me of a cookery programme she had watched on UK television. 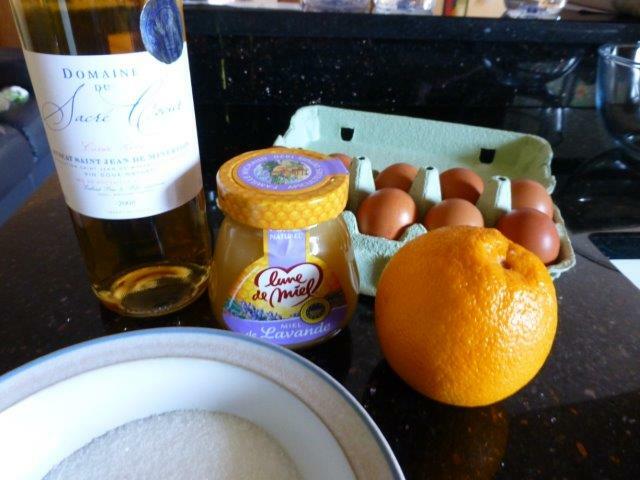 She was intrigued by a recipe for a flan made with Muscat de Saint-Jean-de-Minervois wine, and she was very keen to try it out. We made a date for us to cook this together, and I watched the video, to see what it was all about. The recipe comes from Hairy Bikers’ Bakeation (pronounced like vacation? ), and was first shown on Television on April 24, 2014. The show featured recipes for an apricot tarte tatin, brioche sausage rolls, praline brioche, and the flan de Saint-Jean-de-Minervois. Out of those recipes, I will definitely try the apricot tarte tatin, next year when apricots are in season again. I will include the video of the flan at the end of this post, and I’ll get to our flan experiment in a moment, but first a little about the Muscat de Saint-Jean-de-Minervois wine. 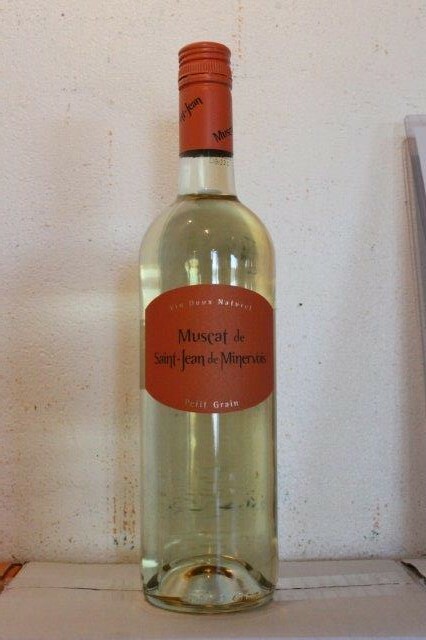 As its name implies, the wine is made from muscat grapes. 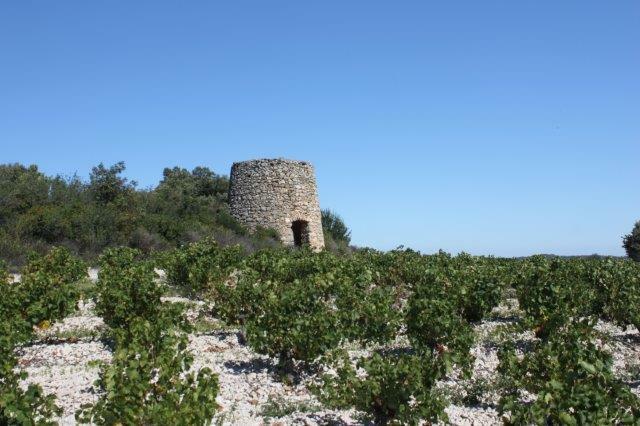 The Muscat de Saint-Jean-de-Minervois is produced in a small area around the little village of Saint-Jean-de-Minervois, which is located 12 km south-west of Saint Chinian. 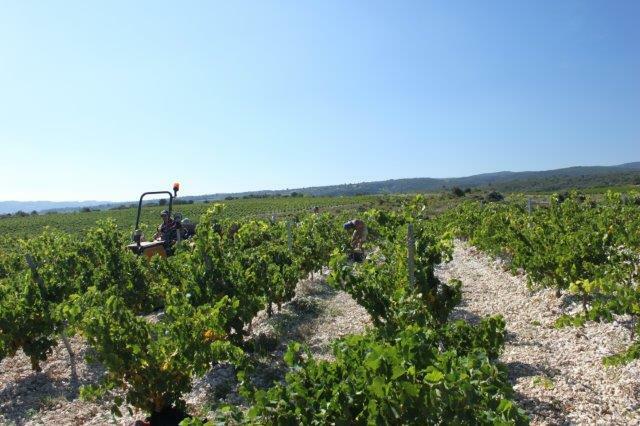 The vineyards are on a limestone plateau at an altitude of 220 to 270 metres. 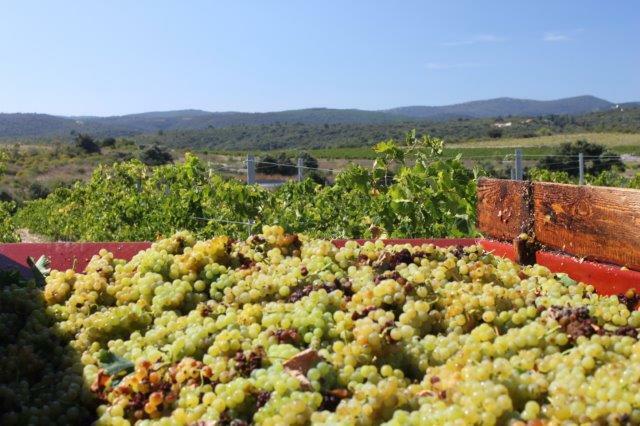 The grapes used in the production are a variety called petit grain, and indeed the individual grapes are very small. 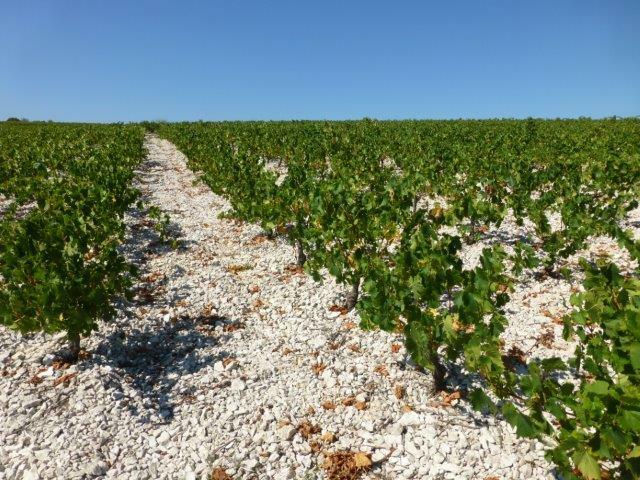 As you approach the village, you’ll notice the vineyards where the plants seem to rise from a white soil. The white colour comes from limestone rocks, bleached by the sun. It is one of the many aspects of the “terroir” for this wine. Harvest of the muscat grapes usually takes place during the first half of September, and I was very lucky to catch some of it. The vineyards above had already been harvested, so there were no grapes left. But just past the cooperative winery in Saint-Jean I spotted a tractor and several people in a vineyard. All of the picking of the muscat grapes is done by hand. I imagine that the grapes are too delicate and small to be picked by machine, although an engineer could probably find a solution if that is the problem. Still, I like the fact that it is all hand-picked! The view of the trailer full of grapes was delicious, and the smell…. I leave you to imagine that :)! The grapes were perfection, with tiny little spots of brown, typical for this grape variety. The lady in charge of the vineyard insisted that I take some grapes with me. She fetched some secateurs, and proceeded to look for some choice bunches of grapes. The very small, shrivelled up grapes were the ones I enjoyed best. They tasted like sun-dried raisins, only better! Next I went to the cooperative winery, where I quizzed the lady behind the counter. The Cave Cooperative produces three different kinds of muscat wine. The Cuvee Petit Grain is the entry level muscat, with a nose of ripe fruit (apricot jam) and lime flowers, and a honey like finish. This wine is good with grilled chestnuts, blue cheese and apple tart. Next up is the Cuvee Selection, blended from the best batches of muscat of any one year. The colour of this wine is somewhat paler than that of the Cuvee Petit Grain, and it has a strong nose of fresh fruit (mango and litchi) and thyme flowers, with an aftertaste reminiscent of fresh figs. Just so you don’t think I’m making this up, the information comes from the official tasting notes :)! This wine goes well with foie gras, melon, strawberry soup, and braised turnips from Pardailhan. 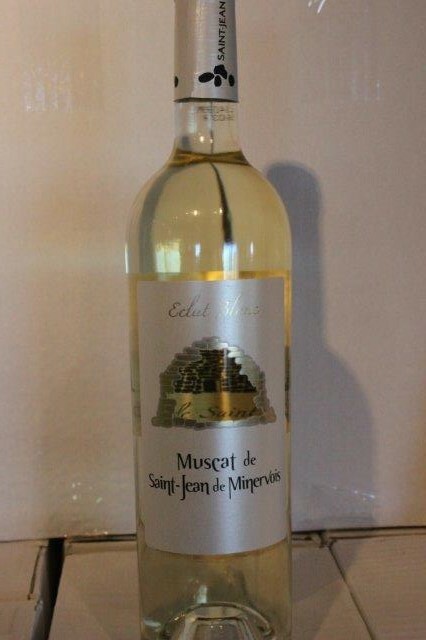 The top-notch muscat is called Eclat Blanc, and of the three is the one I like best. It has an incredibly pale colour, and a nose of lime flower, acacia, citronella and clementine. There is a wonderful balance of sweet and acid, and it has great freshness and finesse. Apparently you can drink this wine with your whole meal. I don’t think I would though, as at 15% alcohol it is rather strong. The reason the muscat wines are so strong lies in their vinification. The fermentation of the wines is stopped at a certain point by adding alcohol, which preserves some of the sugar present in the grape juice. 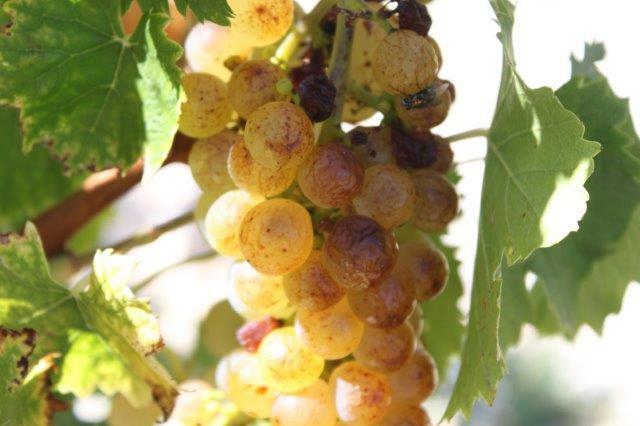 If the grapes are harvested a little earlier, and the wine is left to ferment naturally, you end up with a Muscat Sec, a dry muscat wine, which has the wonderful floral notes on the nose, but none of the sweetness when you drink it. The cooperative winery produces a number of other wines apart from muscat, including a sparkling wine made with muscat sec, and red and rose wines. The picture on the left shows a selection of bottles of muscat from the winery through the years, and the display in the picture on the right shows all wines currently for sale. By now you’re probably wondering if we will ever get to the flan! Yes, we will – we’re starting right now!! 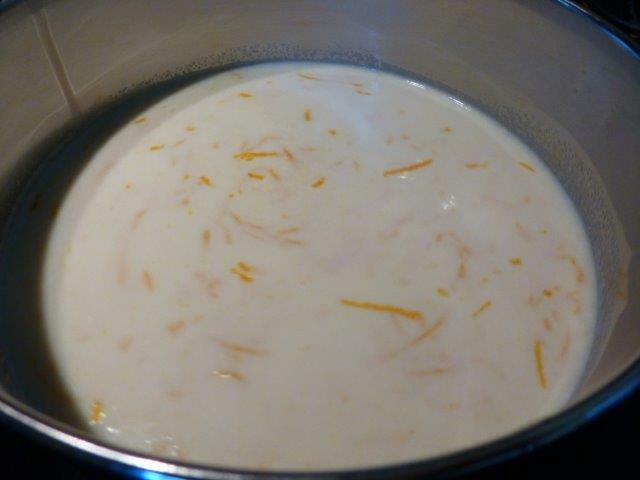 The ingredients are simple: milk, eggs, sugar, muscat, lavender honey, and orange zest. 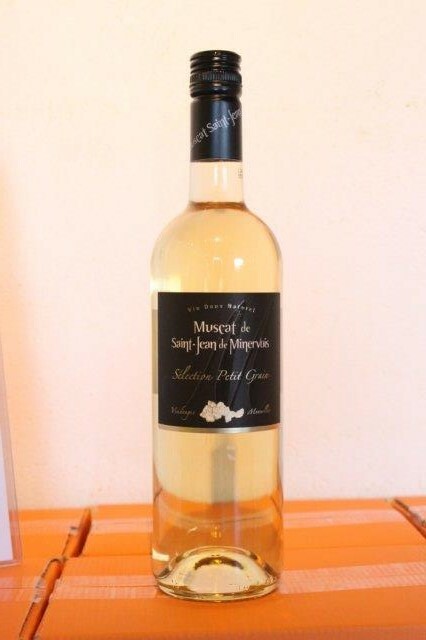 The muscat we used came from Domaine Sacre Coeur in Assignan – there are a number of independent producers of Muscat de Saint-Jean-de-Minervois, in addition to the cooperative winery. 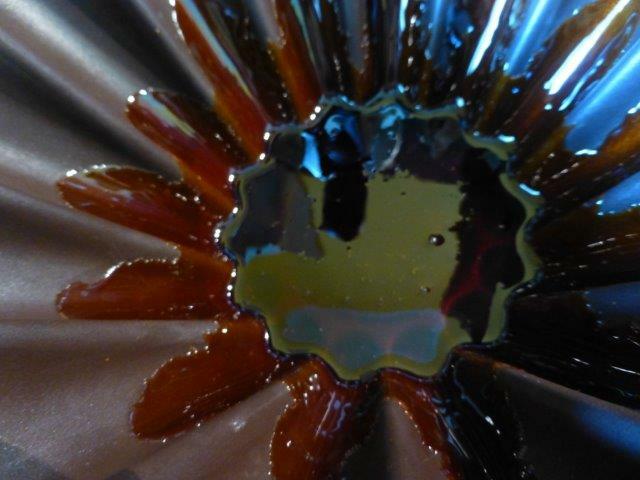 None of the preparation of the flan is very complicated. You will find the entire recipe here. Having watched the video and read the recipe, I’m relieved to see that they do not specify a non-stick pan for making the caramel in the recipe. To my mind using a non-stick pan when cooking sugar is a total no-no – the temperature rises far too high, potentially damaging the non-stick finish, and releasing who-knows-what in the process. Immediately after I took the picture I poured the caramel into the waiting brioche tin, and swirled it around. The tin did get quite hot, so oven gloves or a cloth to hold the tin with are a very good idea. And don’t get any caramel on your hands! 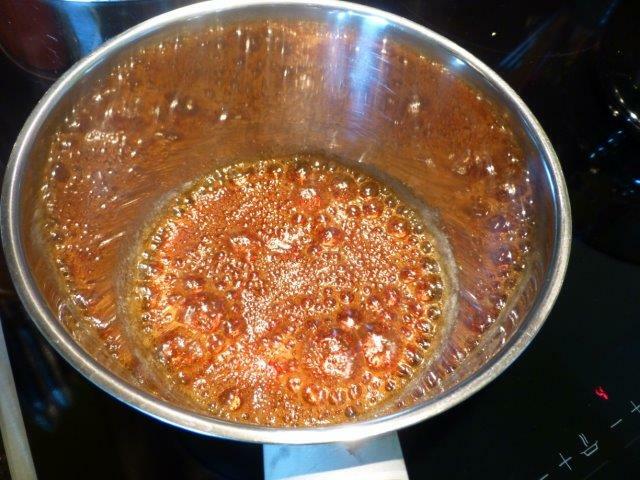 And when the caramel was cooling in the tin and the milk sufficiently infused, we cracked the eggs into a bowl, beat them well with the muscat wine, strained the infused (and slightly cooled) milk onto the beaten eggs, and then poured all of it into the prepared brioche tin. The tin was placed inside a cast iron casserole, and boiling water poured in to a height of two thirds up the side of the flan tin. The flan required five minutes more cooking time than the recipe indicated, and it was covered with tinfoil part way through the cooking. 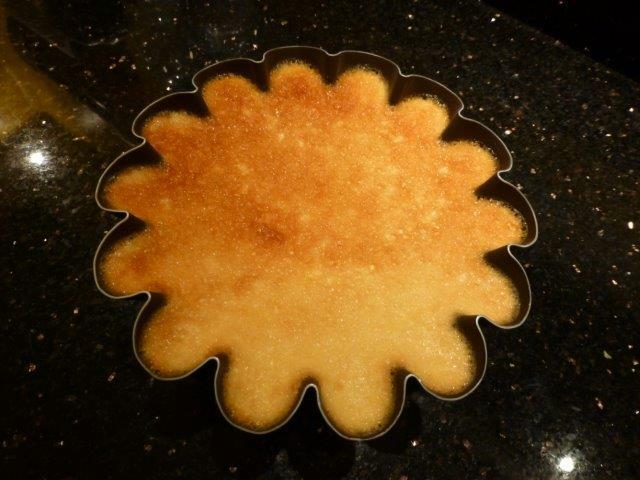 A couple of days later I had dinner with my friends, and we had the flan for dessert. Un-moulding it was a little nerve-wracking – would it come out OK and in one piece?? 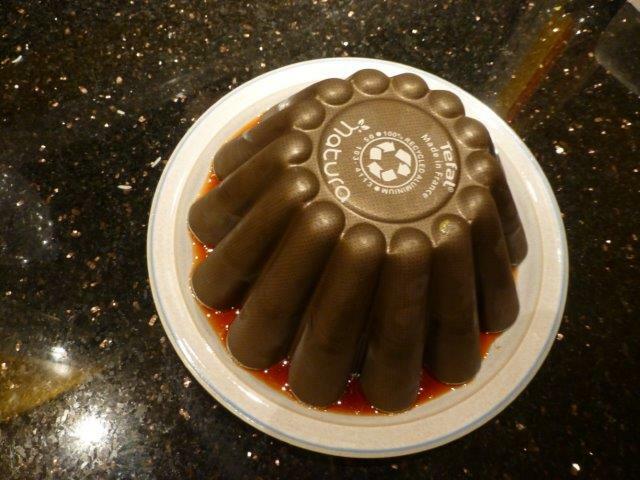 The caramel showing around the tin is a good sign – it means that the flan has released. Yes!!! We did it 🙂 And I think it looks even prettier than the flan on the TV show, but then I am biased!! The texture was lovely and silky, the taste was good, but I could not taste the muscat, and I felt that it could have been a little sweeter. 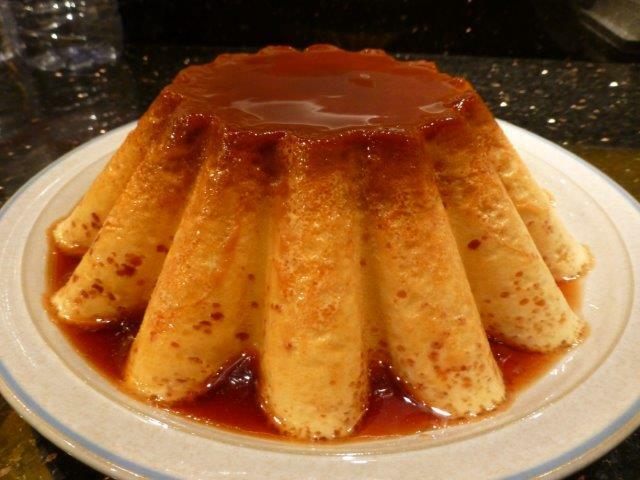 All in all it is a great dessert, and very easy to prepare once you have mastered the caramel. I took a piece of flan home with me, since there was too much for the three of us to eat at one meal. I ate it a couple of days later, and felt that the flavour had improved. If you are tempted to make this, do plan ahead and leave it to sit in the fridge for a few days, I would say up to four days is good. I will certainly make it again! I may have mentioned before that the production of fabrics played a very important part in the local economy in days gone by. In Saint-Chinian, fabric production ceased more or less after the devastating flood of 1873, but further north the textile industry continued to flourish until the middle of the 20th century. 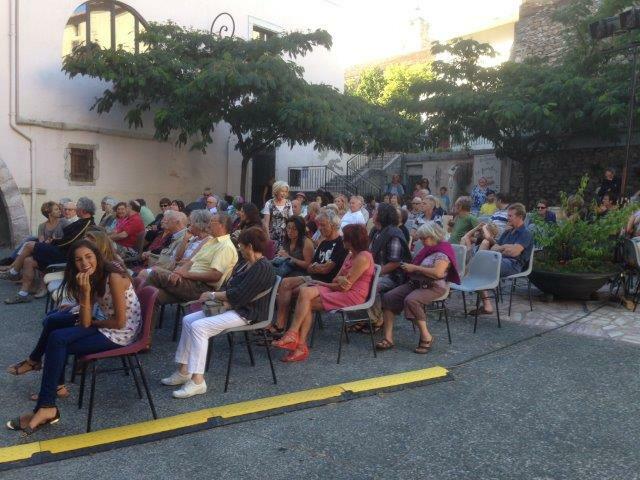 Labastide Rouairoux celebrates its textile heritage each year on August 15 with the Fete du Fil. At the height of the textile industry, 50% of the town’s 6000 inhabitants were employed in the various mills and associated trades. Today, only one mill is still in operation, and the population of the town has dropped to around 1500 persons. 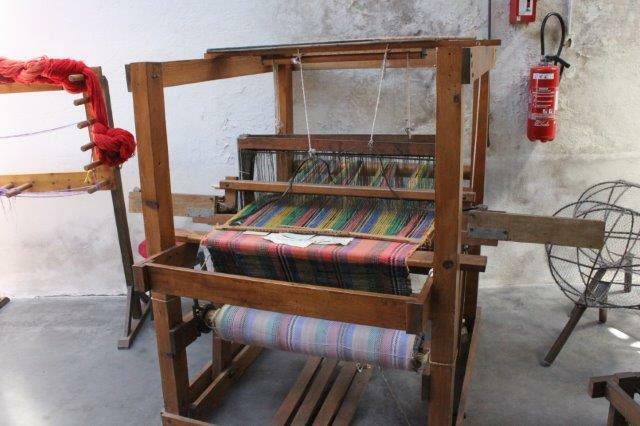 The ground floor of the museum is taken up with heavy machinery, such as the looms and other machines used to transform the raw materials into fabrics. The loom below is a traditional wooden loom, and to the left of it is a frame for creating the warp. 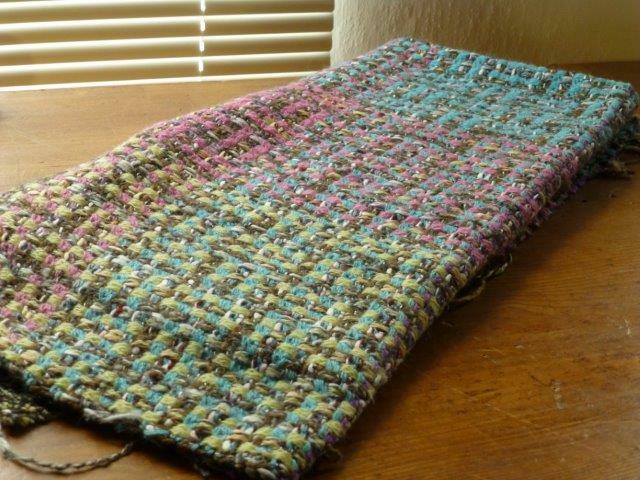 Neither would have been used in recent times for the industrial production of fabrics. There are numerous exhibits on this floor, all of them fascinating to me – I could have spent hours poring over them all. A number of volunteers were on hand to demonstrate some of the machines. The carding machine, which prepared the fibers for spinning, was fascinating! Raw wool of two different colours went in at one end, and was turned into “pre-thread” at the other end, ready for the spinning machine. The disks of “pre-thread” were the put on the spinning machine, where they were turned into yarn, at an incredibly high speed :)! The same spinning machine was also used to make fancy yarns, by twisting together two or more strands of different threads at different tensions. 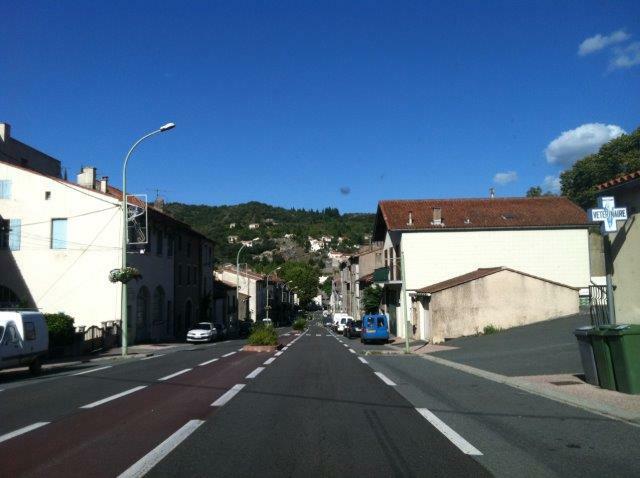 The variety of what was produced in Labastide at one time, seems endless. 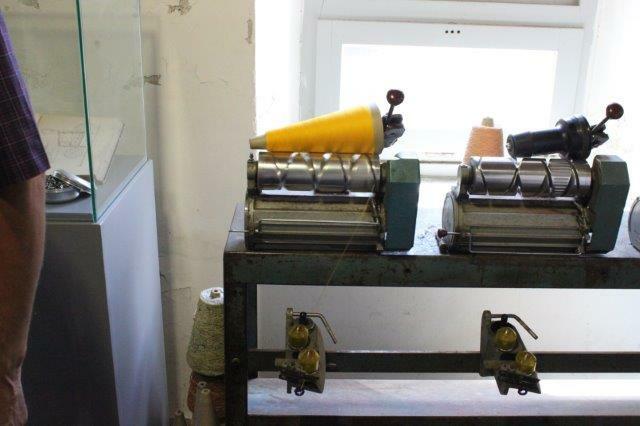 Next to the spinning machine was another machine, which wound the threads onto the standard cardboard cones, which are still used in the textile industry today. The warping frames progressed from the simple wooden frame you saw next to the loom in the earlier picture, to enormous machines capable of creating the warp for a piece of cloth 600 metres long! The white threads ended up on a loom which produced a fancy fabric – several different types of yarn are used in both the warp and the weft. 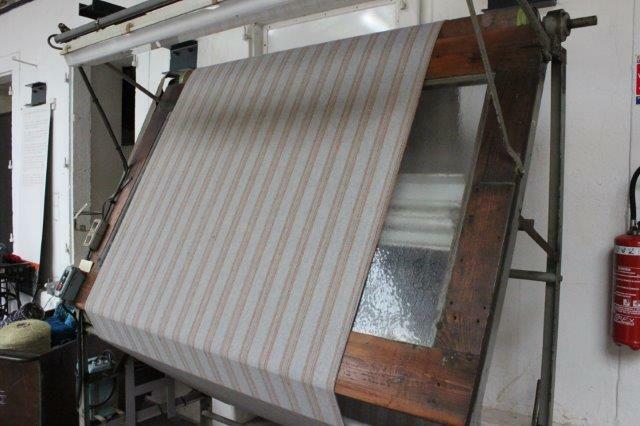 The coloured threads were used to produce a lovely striped fabric, on a loom which had come all the way from the US! 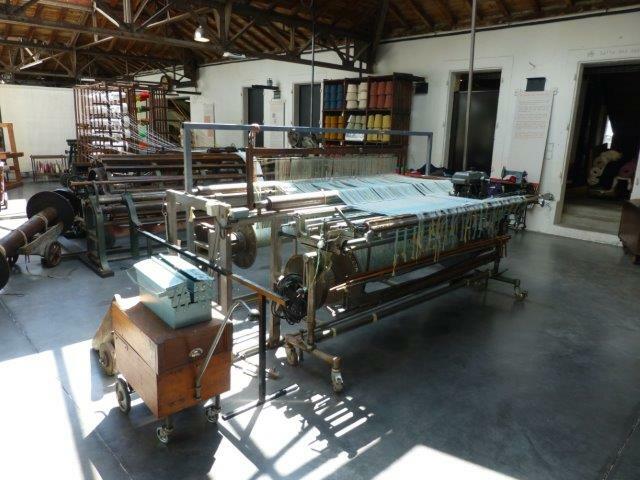 The machine in the picture below was used for quality inspection of the woven fabric – bright lights were used to show up any irregularities in the fabric. 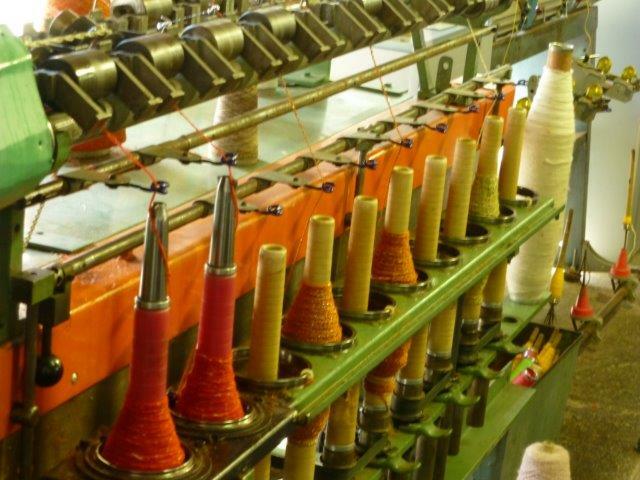 Winding the thread onto the bobbins, so that it could be used on the looms, was also done by an ingenious machine. The drums at the top would hold empty bobbins, which would be automatically dropped down, filled up and ejected! The room next door showed a variety of finishing processes, such as dyeing, felting, brushing, shearing, and I’m sure there were some I have forgotten. On the first floor was an exhibition of what all the thread and cloth could be turned into. There were rows upon rows of fabric swatches, produced for the likes of Chanel, Courrege and Dior, at the forefront of Haute Couture. 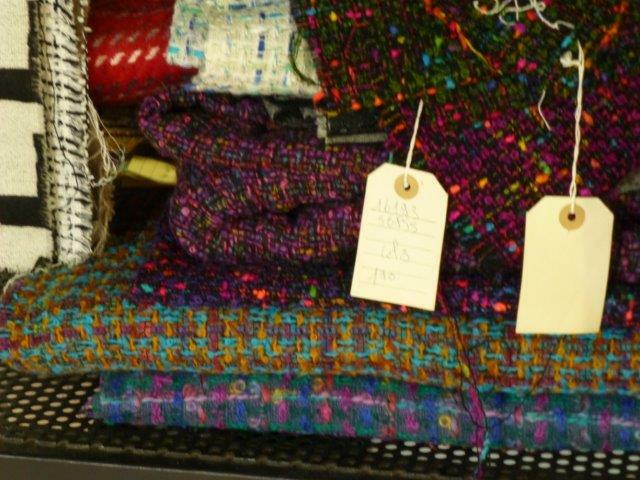 The museum also has a shop, where you can buy some of the fabrics woven in the museum. It is a truly wonderful resource for anyone interested in textiles! 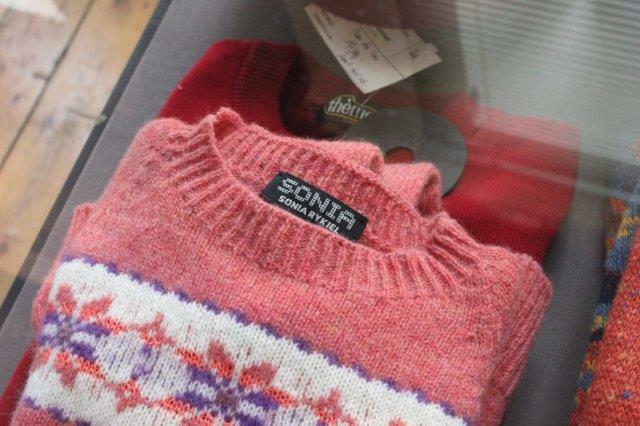 The fabrics are made from cotton or a blend of linen and cotton, and not treated in any way. They appear to be very firm and stiff, but will soften with use and last a very long time. I have my eyes on some of the striped deck chair fabric, to give new life to an ancient deck chair which is lingering in my garden. 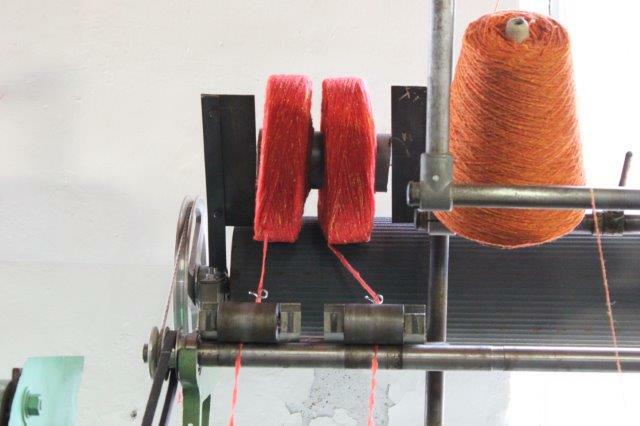 The factory also produces woolen blankets, with the wool from the Lacaune sheep, which are raised locally. I was very taken by the hand-woven carpets of La Main des Sables. 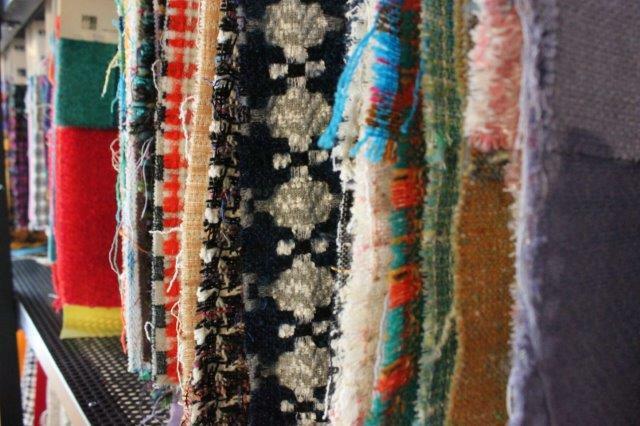 All the wool is dyed using plants and natural dye materials, and the carpets are woven in Morocco in the traditional fashion. The colours are beautiful and the patterns are gorgeous, as you can see. The village hall of Labastide hosted an exhibition of textile art, as well as several workshops on textile art and jewelery making. There were demonstrations of lace-making, as well as an exhibition of a well-known brand of sewing machines, and there was Cafe Tricot, where you bring your knitting and join fellow knitters for a cup of coffee or tea :)! Among the art on display were some fantastic pieces by Marie-Christine Hourdebaigt, using a variety of techniques to achieve incredible effects. 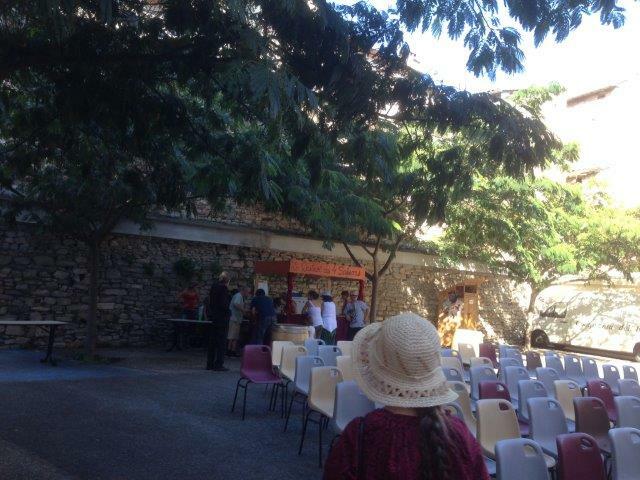 So, we’ve done the round of the whole of the Fete du Fil, and come to the end of our visit. I do hope you enjoyed your day out! If you are in the area on August 15 next year remember the fete will be on, and the rest of the year you can always visit the museum and take a walk around the town. There is always something to discover! This week’s post has been contributed by Annie Parker, my friend and trusted proof-reader, without whom my texts would be full of grammatical errors and mistakes. 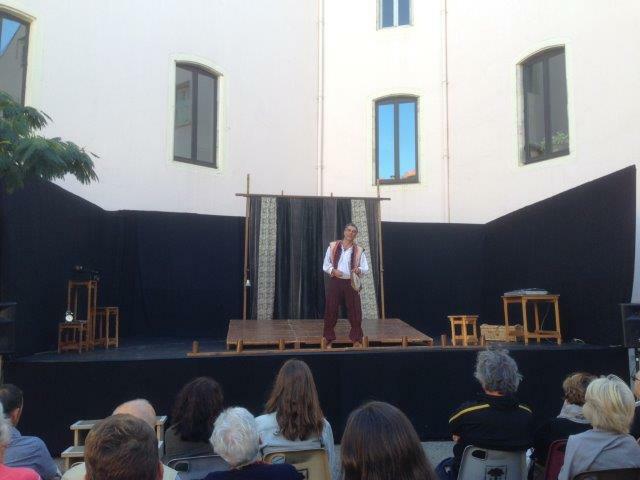 Thank you so much for sharing your Commedia dell’Arte impressions with all of us, Annie! 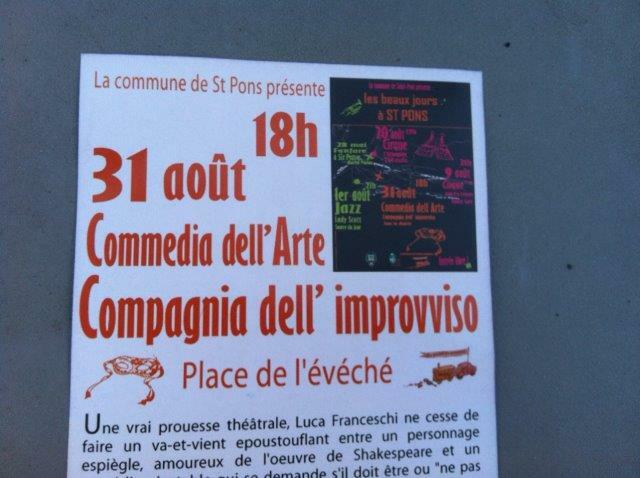 And then, almost without transition, there we were in St Pons! 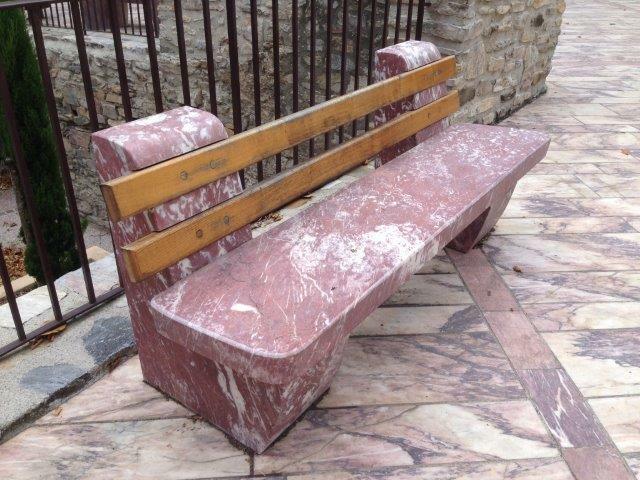 A major reason that St Pons fascinates and attracts us is that there are entire sections where the sidewalks are made of marble – not just scraps and pebbles of marble, but slabs of incredibly beautiful marble. We looked in awe at these beautiful sidewalks, wondering whether perhaps we should have removed our shoes before walking on them, but in St Pons they seem to take them thoroughly for granted. Oh! The tension and attention that creates — the great fear (at least on my part): will I be the next victim?! But it was also what my husband referred to as “a two-character show with one actor” – and thus another aspect of “to be or not to be” was created: as the play progresses, we discover that the comic character we have gotten to know a bit is a character created by an actor who has a dream of putting on a one-man show of the most important Shakespearean soliloquies. He is, however, having great difficulty finding anyone to back him in this endeavour. In an attempt to invigorate his performance, he brings his voice down to a low, hoarse, croaking quality and throws on an old hat that he has discovered – thereby becoming the comic character that we have already gotten to know. As the show progresses, there are physical tussles between the two characters (behind the screen), each trying to take control of the other, complete with bangs and booms; curtains jostling around, ‘showing’ the struggle ensuing behind them; hands leaping up above the screen or being pulled submissively back from between the curtains; with one or another of the characters periodically appearing to the audience, only to be dragged back behind the screen by the ‘other’ character. 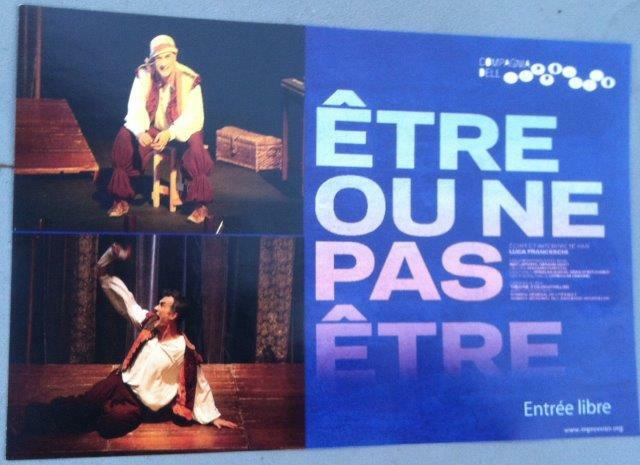 It was a wonderful piece of pantomime! In the end, the comic character submits to the actor . . . or does he? 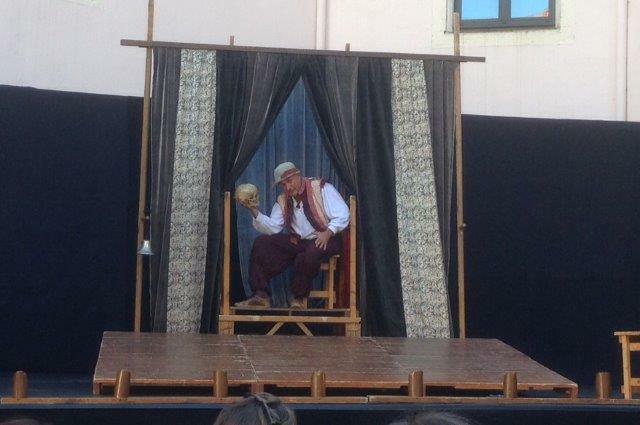 The enthusiasm of the audience, with vigorous applause, punctuated by cries of “Bravo!” brought Luca Franceschi, the actor, comic, and creator of the show back for repeated curtain calls, all immensely deserved, as far as we were concerned. Strangely, the drive back home seemed even more beautiful, possibly because of the different perspective . . . possibly because of the evening shadows . 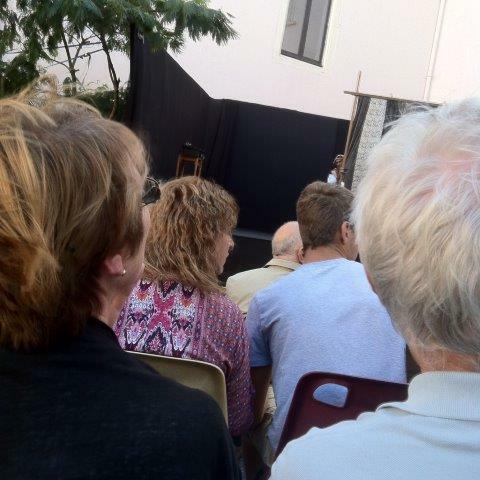 . . possibly because we had been emotionally opened up by the performance. Fortunately, it was still light enough outside to take a couple of additional pictures. 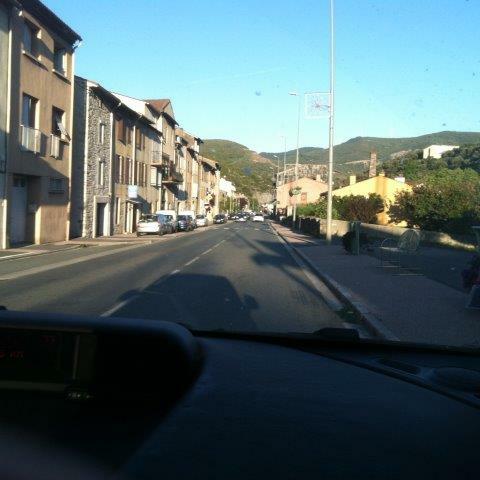 Good bye, St Pons! Thank you for a wonderful afternoon!